With sovereign wealth funds rapidly becoming one of the most powerful forces in global finance, one key question has emerged: Should they be feared or revered? With the subprime-induced credit crunch causing stocks of financial giants such as Citi and Merrill Lynch to plunge amid fears that there is worse still to come, could it be that a new breed of “white knight” is lurking in the wings—potential investors that are virtually ungeared and sitting on a mountain of cash, longing to buy into the financial know-how and market expertise of the world’s premier financial institutions? Not to mention well-established brands in retail, manufacturing, energy and, yes, even real estate? The answer is yes. They are the sovereign wealth funds of oil-rich Gulf emirates and the export-led “wonder-economies” of Asia such as China and Singapore. Taken together, they already control assets valued at more than $2.2 trillion, and, on the back of record commodity prices and booming exports, they are expected to grow fast within the next decade, reaching between $12 trillion and $14 trillion. They are already buying into a range of financial companies in the United States and Europe. The China Investment Corporation’s $3 billion stake in hedge fund Blackstone Group may be sitting on a paper loss despite the 4.5% discount to the IPO price, but that has not discouraged China from putting another $1 billion into Bear Stearns. Meanwhile, Singapore’s Temasek Holdings has bought a £2 billion chunk of UK bank Barclays. The Qatar Investment Authority (QIA) holds more than 20% of the London Stock Exchange, where it is in a bidding war for stock with its neighbor the Dubai International Financial Exchange (DIFX). Besides which, the QIA holds nearly 10% of the OMX Nordic Exchange along with smaller stakes in other European bourses. The US has gone even further in upping the ante, with protectionist noises emanating from congressmen of all political leanings and literally dozens of bills on the subject being promoted. During the run-up to next year’s election, more voices will join the protectionist chorus—not just on trade and currency exchange issues but on the looming threat of more strategic stakes or even takeovers by foreign, state-controlled investment vehicles. Gerard Lyons, chief economist and group head of global research at UK-based (but mainly Asian-markets-driven) Standard Chartered Bank, agrees that the financial muscle exercised by sovereign funds is going to be felt increasingly if globalization continues. As economic adviser to Standard Chartered’s board, Lyons has a privileged viewpoint, since several sovereign funds are major stakeholders in the bank. Singapore’s Temasek Holdings has a 17.2% holding, while Dubai’s Isthimar spent $1.2 billion buying into the bank’s stock. Lyons expects these government-controlled funds to invest more in fast-growing emerging markets and into alternative investments such as private equity and hedge funds. Early signs of these trends have already emerged. Most of the Asian funds invest heavily in neighboring countries that do not enjoy the same levels of trade surplus, such as Indonesia and Thailand. There is also a merging of more or less secretive sovereigns with the less transparent kinds of Western financial groups—namely, private equity and hedge funds such as Apollo, Blackstone, Carlyle and GLC, all of which now have sovereigns as substantial shareholders. “The Chinese are particularly interested in developing a network of emerging market funding vehicles in Africa, Latin America and Asia,” says Paola Subacci, head of the UK think-tank Chatham House’s international financial program. And China’s investment strategy to date in resource-rich countries in Africa and elsewhere and its unwavering approach to investing in Sudan, Burma (Myanmar) and Iran indicate what path other massively wealthy sovereign funds might go down in pursuit of national strategic advantage as well as purely financial returns. What is more, they will face no competition from more ethically sensitive funds or those based in countries where issues such as human rights or preventing nuclear proliferation place constraints on investment. These less “sensitive” sovereign funds should be able to leverage their money to achieve maximum strategic benefit. That is one of the problems Lyons sees in what he calls state capitalism. The other is the growing tendency among some sovereign funds to acquire “more strategic stakes in sensitive areas within developed countries.” Dubai Ports World may have had to sell off its US port infrastructure assets after protestations from Capitol Hill, but it is still the world’s second-biggest port operator, with key transport infrastructure across Europe, Africa, Asia and Australasia. 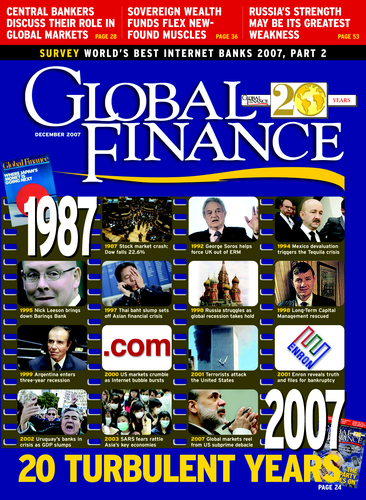 “We are seeing more strategic investments,” says Lyons, “from China, Malaysia and some of the Middle Eastern funds.” Supporters of the global free flow of capital are less concerned with what they view as the investment side of the globalization process beginning to pick up, assisting the flow of capital to where it can be invested most efficiently. That it is now mostly coming out of Asia simply reflects a fundamental shift in the balance of trade. But there are a number of issues about these funds that are certain to cause friction. First, there is the simple fact that they are state-owned and could be utilized to achieve political or strategic objectives. Second, there is the question of transparency. The reason that estimates of the size of most Middle Eastern funds vary so much is because the funds are so secretive—about their funding, their existing holdings and their ongoing investment strategy. Of eight Asian or Middle Eastern sovereign funds contacted by Global Finance, four did not reply, three declined to comment, and the last shuffled the question back and forth between its executive and operating arms and so achieved a similar result. Such secrecy in turn raises questions about potential unfairness. If other classes of investors must abide by rules of disclosure (and it looks increasingly likely that greater transparency will be demanded of private equity and hedge funds), how can they compete with massively wealthy and yet opaque sovereigns? Moreover, investors from open economies such as the UK that have previously placed few restrictions on foreign ownership might well demand the opening up of markets in countries from which sovereign wealth funds emanate. Market watchers caution that this will take time, and we are likely to see Western governments seeking to protect national champions and strategic sectors in the meantime. This is already happening in the US, and there are signs of a hardening of stances across Europe. As a result, there is a real possibility of Western governments and sovereign wealth funds clashing over what they can buy and where. Western views about sovereign funds have changed over the past year, says Lyons. “When the IMF put out a report in 2006, there was not much interest. It is the emergence of major funds in China and Russia that has galvanized the West,” he adds. Whether that will put a serious wrench in globalization’s works remains to be seen. Subacci believes these fears are exaggerated and that, rather than studying Western reactions, one should try to understand better the role of the sovereign funds. As a first step she distinguishes between funds from countries with large export/trade-based surpluses, such as China Investment Corporation or Singapore’s SGIC and Temasek, and what she defines as commodity funds. These are based in countries that, thanks to soaring global commodity prices, are building up huge foreign currency reserves by selling their natural resources on international markets. “Commodity funds present very different issues,” she says, “as their underlying purpose is to replace the commodity sold with other assets.” These funds may be intended as a kind of pension fund for future generations after revenues from oil, gas or other non-renewable natural resources have either run out or been severely depleted. Kuwait’s Future Generations Fund and Norway’s Government Pension Fund are both examples of this, though in their modus operandi and levels of transparency they are poles apart. The Kuwait Investment Authority, which decides the investment strategy of one of the oldest sovereign funds, founded in 1953, is secretive and has proved troublesome to Western governments in the past—as when it built up a 21.7% stake in British Petroleum following the oil giant’s privatization in 1988. That triggered the first major showdown between a sovereign fund and host government, and while Kuwait was allowed to unwind its position, the incident set a marker on what sovereign funds could or could not do in the future. Another oil-rich country, Norway, established its own National Pension Fund in 1990 to meet the growing pensions bill expected after 2015. The purposes are similar, and the Norwegian fund is now the second largest in the world, with more than $320 billion under management. But it is highly transparent, publishing its annual and quarterly reports, and invests in a broad range of bonds and equities in some 3,500 companies with stakes of 1% or less. Moreover it has an ethical screening process to exclude companies that commit “unacceptable violations of fundamental ethical norms.” It even blacklisted Norway’s own national champion, oil and gas giant Statoil, amid allegations of corrupt practices. Russia’s Oil Stabilization Fund represents another sub-species of sovereign fund. Again, it is funded mainly by energy exports, but from its creation in 2004 it was primarily intended to stabilize the monetary impact of fluctuations in energy prices and thereby prevent a repeat of the 1998 crisis. Last April, however, Russia decided to divert foreign currency reserves in excess of 10% of Russia’s GDP to longer-term and riskier investments to achieve higher returns, which will go toward providing a pension pot for future generations of Russians. With oil approaching $100 a barrel, it is estimated that Russia’s new Future Generations Fund could launch early next year with a $100 billion war chest. It is not just direct stake-building by sovereign funds themselves but their potential to support proxy bidders such as state-controlled banks or national champions that is causing concern about the way state capitalism is mutating in Russia and China. The energy giant Gazprom has made clear its desire to invest in downstream operations such as gas distribution companies in Western Europe, which would give it control of the entire supply chain. Obviously such investments would be seen as having strategic implications. As for transparency, “at times it’s hard to tell whether it’s the Kremlin or Gazprom that’s calling the shots,” a Western oil executive in Moscow told Global Finance, albeit on a strictly anonymous basis. “A large number of sovereign funds are strategically focused on banking and finance or energy-related companies,” says Subacci, adding that this could raise regulatory and political issues. So far, strategic investment in banking and finance has been limited mainly to the regions in which the sovereign funds are based—the Gulf funds concentrating on Arab banks and the Asian funds building stakes in domestic banks or those in neighboring countries. But there are clear signs they are moving further afield to the US and Europe. Western countries have already shown they are not willing to allow control of strategically important companies, with their intellectual property, technical know-how and financial expertise and contacts, to go to state-controlled funds whose investment strategies and ultimate intentions are unclear. One answer might be for sovereign funds to become more transparent and to sign up to a code of conduct that might be monitored and regulated by the IMF or some other multilateral body. How those rules could be enforced, particularly during periods of international tension, is another matter completely. What is certain is that we will be hearing plenty more about sovereign funds in the year to come.